By Saira Ahmad, M.D., James E. Kovacs, D.O. 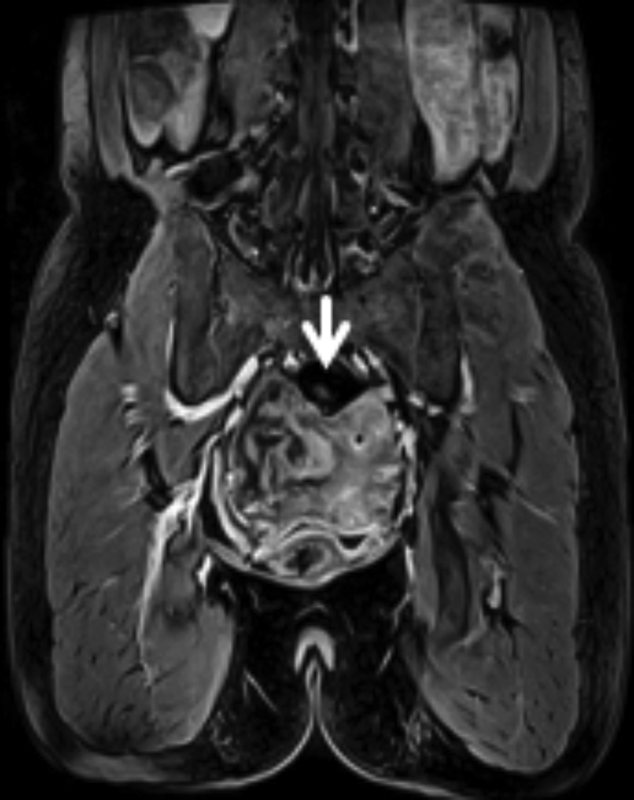 A 46-year-old G2P2 woman with two prior Cesarean sections presented with several months of pelvic discomfort and urinary frequency. Serum beta human chorionic gonadotropin (hCG) was negative. 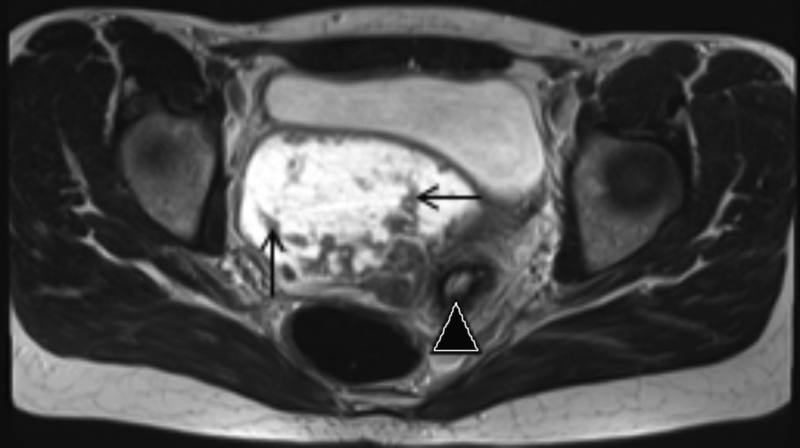 For initial evaluation, a pelvic ultrasound (US) with transabdominal and transvaginal approach was obtained, which demonstrated a complex cystic mass to the right of the lower uterine segment (Figure 1A). Based on the US findings, follow-up MRI was performed (Figures 1B-D). Distinguishing a cystic adnexal mass from a uterine lesion is rarely challenging. Exceptions to this include a pedunculated leiomyoma with cystic degeneration, cystic adenomyosis, and a unicornuate uterus with a rudimentary obstructed horn. In the case presented, cystic degeneration of a pedunculated leiomyoma is an appropriate consideration, in addition to nonuterine (typically ovarian) adnexal pathologies. Since most adnexal masses are initially evaluated by ultrasound, every effort must be made to evaluate the risk of malignancy, as ovarian cancers are responsible for 5% of all cancer deaths in women. MRI is typically performed in situations where this risk cannot be confidently excluded by sonography. Computed tomography (CT) is mainly utilized for staging adnexal malignancies. Epithelial neoplasms account for approximately 70% of ovarian cancers. Subtypes of surface epithelial ovarian neoplasms are serous or mucinous cystadenomas, serous or mucinous cystadenocarcinomas, clear cell carcinomas, Brenner tumors, endometrioid, and undifferentiated epithelial tumors. Epithelial tumors are often primarily cystic with varying proportions of solid components. Another distinctive feature of epithelial tumors is the presence of papillary projections. It is important to identify the imaging features suggestive of malignant cystic ovarian neoplasms, which are a larger size (typically > 4 cm), heterogenous architecture, wall thickness > 3 mm, irregular and/or thick septations with abnormal enhancement, large soft-tissue component with necrosis, and mural nodularity.1 Blood flow within the septa and papillary projections is usually documented on Doppler ultrasound and helps differentiate from avascular clots adherent to the cyst wall, a common feature of hemorrhagic cysts.2 In addition, invasion of adjacent structures, peritoneal implants, ascites, and lymphadenopathy are findings that serve as strong evidence of malignancy. Characteristics suggestive of benign epithelial tumors include entirely cystic composition, size < 4 cm, thin walls, and the lack of internal structure. Hemorrhagic ovarian cysts predominantly present in premenopausal women and in postmenopausal women taking hormone-replacement therapy. The characteristic ultrasound appearance is that of a thin-walled cystic mass with a web-like pattern of lacy internal echoes and accentuated through transmission. Other diagnostic findings include a fluid-fluid level, prominent blood flow, and acoustic streaming from particulate matter within the hemorrhagic cyst. Endometriomas may appear identical to hemorrhagic cysts; however, they do not demonstrate acoustic streaming.5 Often, retracting clots adherent to the wall mimic papillary projections of epithelial tumors, but lack blood flow, which is characteristic of malignant epithelial tumors.2 Follow-up with pelvic ultrasound may be performed to confirm complete resolution. Mesothelioma is a tumor of the mesothelial cells that form the lining of several body cavities and organs. Peritoneal mesotheliomas are second only to pleural mesotheliomas as the site of involvement for mesotheliomas.2 The three commonly recognized subtypes of peritoneal mesotheliomas include malignant mesothelioma, cystic mesothelioma, and well-differentiated papillary mesothelioma, with significant overlap in the pathological appearance of these subtypes. However, grape-like multilocular cysts and multiple unilocular thin-walled cysts favor the diagnosis of cystic mesotheliomas. Cystic mesotheliomas characteristically present with pelvic involvement in young to middle-aged women. An associated history of prior abdominal surgery or pelvic inflammatory disease will often be present. These tumors tend to have a high recurrence rate of approximately 50% after surgical resection.6 Although once widely believed to have no metastatic potential, malignant transformation of cystic mesothelioma may occur. Uterine leiomyomas are benign smooth muscle tumors of the myometrium. They are commonly classified as intramural, submucosal, or subserosal based on location. Subserosal leiomyomas may appear predominantly extrauterine when they are pedunculated and project exophytically into the abdomen or pelvis. It is essential to be mindful of the atypical appearances of leiomyomas, which may result from atrophy, internal hemorrhage, cystic degeneration, fibrosis, and/or calcification. Hyaline degeneration is the most common type of degeneration, with hyalinized collagen accounting for the characteristic low signal intensity on T2-weighted MR images. Cystic degeneration is much less common, occurring in approximately 4% of leiomyomas.7 A pedunculated leiomyoma may mimic an adnexal mass if cystic degeneration is present, especially if it has a very thin stalk or if it is parasitized (receiving blood from nearby structures).8 Moreover, elevated CA-125 levels have been reported with pedunculated leiomyomas.8 The bridging vessel sign is definitive in confirming the uterine origin of these exophytic leiomyomas.9 This sign refers to the presence of a pedicle or a vessel bridging the mass and the myometrium (Figure 1C), and is demonstrated by flow signal on color and power Doppler ultrasound or unenhanced MRI showing the vessels as curvilinear tortuous flow voids. The vessels represent feeding vessels that arise from the uterine arteries and course through the myometrium to supply the pedunculated leiomyoma. 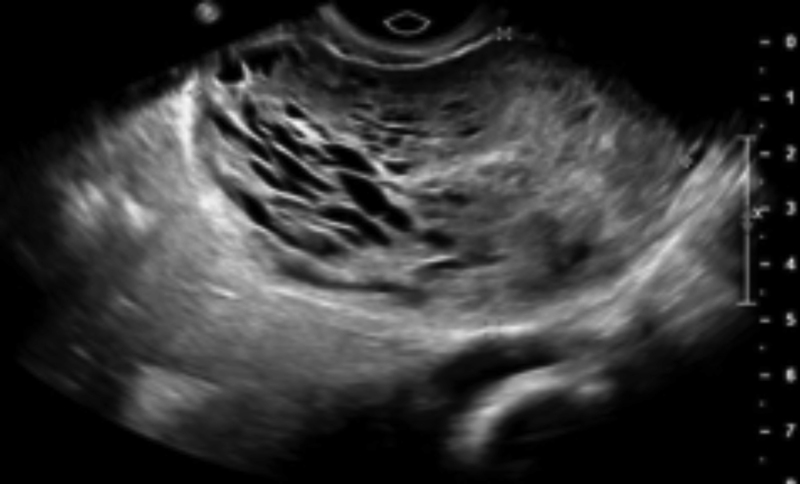 Cystic adnexal masses are commonly found on pelvic ultrasound examinations. Because most adnexal masses arise from the ovaries, pelvic cystic lesions that are not of ovarian origin may not routinely be considered in the differential diagnosis. Uterine masses that may present as cystic adnexal masses include a pedunculated leiomyoma with cystic degeneration, cystic adenomyosis, and a unicornuate uterus with a rudimentary obstructed horn. Although cystic degeneration of uterine fibroids is relatively uncommon, the presence of flow signal on color or power Doppler ultrasound or curvilinear continuous flow voids on MRI in a pedicle bridging the mass and the myometrium suggests a uterine origin of these exophytic lesions, as in this case. This is known as the bridging vessel sign. Wasnik AP, Menias CO, Platt JF et al. Multimodality imaging of ovarian cystic lesions: review with an imaging based algorithm approach. World J Radiol 2013;5(3):113-125. Jung SI. Ultrasonography of ovarian masses using a pattern recognition approach. Ultrasonography 2015;34(3):173-182. Ko SF, Wan YL, Ng SH et al. Adult ovarian granulosa cell tumors: spectrum of sonographic and CT findings with pathologic correlation. Am J Roentgenol 1999;172(5):1227-1233. Kim KA, Park CM, Lee JH et al. Benign ovarian tumors with solid and cystic components that mimic malignancy. Am J Roentgenol 2004;182:1259-1265. Clarke L, Edwards A, Pollard K. Acoustic streaming in ovarian cysts. J Ultrasound Med 2005;24(5):617-621. Park JY, Kim KW, Kwon HJ et al. 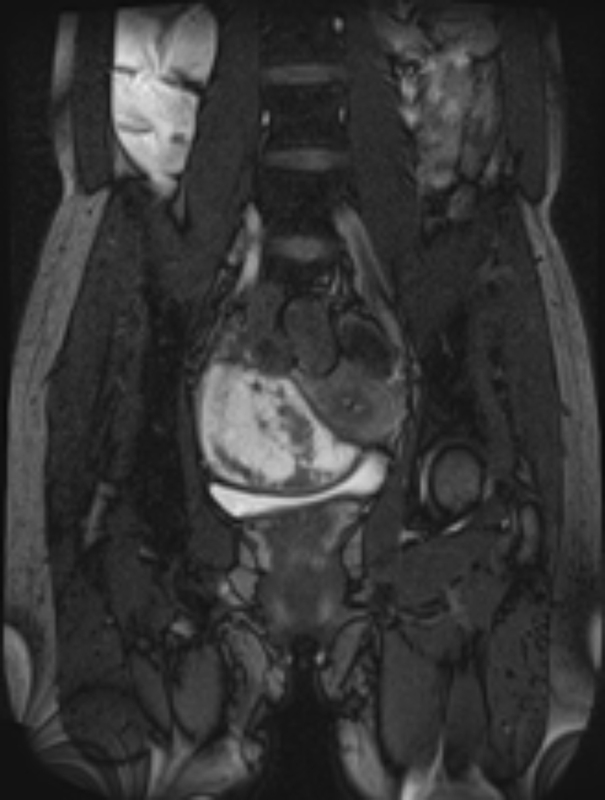 Peritoneal mesotheliomas: clinicopathologic features, CT findings, and differential diagnosis. Am J Roentgenol 2008;191(3):814-825. Yorita K, Tanaka Y, Hirano K et al. A subserosal, pedunculated, multilocular uterine leiomyoma with ovarian tumor-like morphology and histological architecture of adenomatoid tumors: a case report and review of the literature. J Med Case Rep 2016;10:352. Aydin C, Eris S, Yalcin Y, et al. A giant cystic leiomyoma mimicking an ovarian malignancy. Int J Surg Rep 2013;4(11):1010-1012. Kim JS, Lee JH, Lee HJ, et al. Significance of ‘Bridging vessel sign’ on color Doppler ultrasound in diagnosis of uterine subserosal leiomyoma. J Korean Soc Med Ultrasound 2002;21(2),1113-1119. Ahmad S, Kovacs JE. Complex Cystic Adnexal Mass Approximating the Uterine Myometrium. J Am Osteopath Coll Radiol. 2017;6(4):18-20. Saira Ahmad, M.D., James E. Kovacs, D.O. Dr. Ahmad and Dr. Kovacs are with the Department of Radiology, Cooper University Hospital, Cooper Medical School of Rowan University, Camden, NJ.